The first Holy Mass of the Cameroon Catholic Community of Washington, DC (CCCWDC) was celebrated in May 2006 at the Crypt Church of the Basilica of the National Shrine. We moved our monthly celebrations of Mass to the Church of the Resurrection where the then pastor, Rev. Fr. Keffer, graciously welcomed and provided us with our new home. It is ten years now, and the Lord continues to do great things for us. 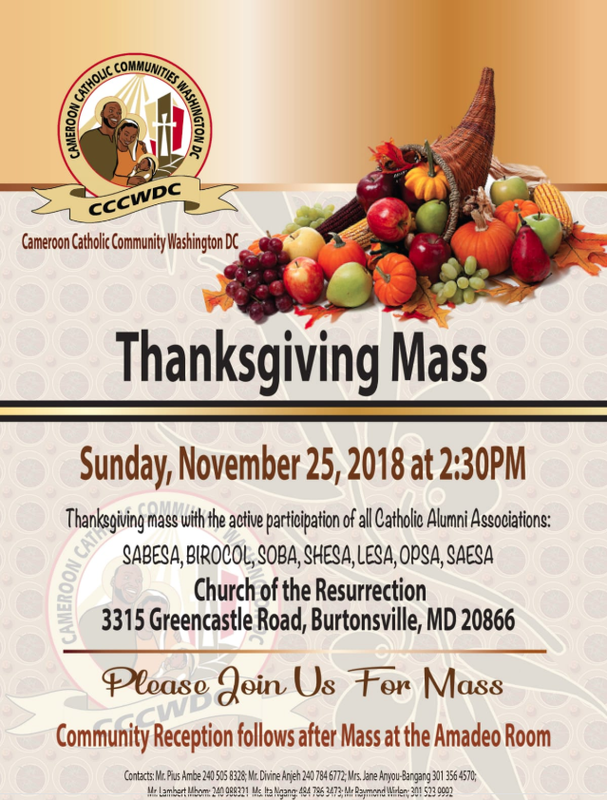 The work started by our community has been emulated by Cameroonian Catholics in the neighboring dioceses of Baltimore and Arlington, where two other communities have since taken root. For these and many other blessings, we are glad and rejoice!